Halifax were handed what appears to be a straightforward route into the sixth round of the Challenge Cup after being paired with the last remaining amateur side, Lock Lane, in Tuesday night’s draw for round five. 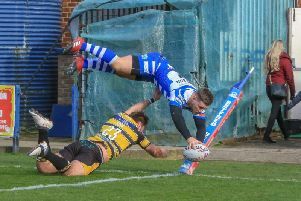 The Castleford side are due at the Shay on the weekend of April 16/17, but will start at long odds to present Richard Marshall’s side with anything other than a speed bump on the road to Wembley. Fax, who head to Oldham in the Championship on Friday (3.0), dispatched another amateur outfit, Pilkington Recs, 78-0 at Langtree Park last weekend.